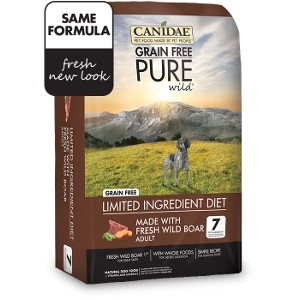 Our CANIDAE® Grain Free PURE formulas use simple recipes for sensitive dogs. Choosing a grain free limited ingredient diet may help pets who experience food sensitivities. Less ingredients could mean less chance of sensitive reactions. Each limited ingredient recipe is made with 7–10 key ingredients that are easily recognizable, plus all the vitamins and minerals your dog needs. And even if your dog isn’t ingredient sensitive, they’ll still love the great taste. Choose from a variety of formulas made with fresh meat or fish first, paired with whole ingredients like sweet potatoes, peas, lentils, or chickpeas—never corn, wheat or soy. Feed your pet all the great taste they crave and all the nutrition they need.